There are many disadvantages of being thrust back into London life, somewhat against my will – to list but a few: the traffic, rush hour and normal; the sheer quantity of people filling the streets, pubs, shopping centres and green spaces; and the aeroplanes passing over my head ever five or ten minutes, jetting off from Heathrow to some unknown destination, almost certainly glorious, tranquil, vibrant and fascinating if only in virtue of the fact that I am not on the plane. But there are also advantages: I get to spend time with my parents, and now that I’m not a hormone-saturated teenager that is a much more appealing prospect than ever before. And I also get to revisit some of my old haunts, not least The Tea Box in Richmond. I have waxed lyrical about the afternoon teas enjoyed after every meet of the Shotgun and Chelsea Bun Club, but I’ll admit I have predominantly focused on the cakey side of things. But another simple joy of these sessions is the opportunity to enjoy nice tea, brewed in a proper tea pot and sipped elegantly (of course) out of a proper porcelain tea cup, complete with saucer. My introduction to tea was a slightly unusual one. My mother lives on the stuff – we actually used to pack small airtight bags of tea bags before going off on holiday. I think if you cut her she’d bleed milky PGTips. My father is just as huge a fan of coffee is my mum is of her tea. He’s been known to both grind and roast his own coffee beans at home, and we have a vast range of coffee making apparatus including a traditional Costa Rican ‘coffee sock’ brought back from my Gap Yah travels, a big plastic coffee syringe, and even some sort of high tech coffee syphon that looks like it belongs in my school’s chem labs rather than my parents’ kitchen. But despite my parents’ obsession with tea and coffee, I never liked either, or indeed any hot drinks at all, not even hot chocolate or warm milk. This continued until I was 19, when, one evening on a particularly unpleasant part of a trek across Costa Rica, I found myself in a sodden tent, camped in the rain at the top of a mountain with a bad stomach bug, having walked since the small hours of the morning and set to get up at 4am the next day to do the same thing again. Feeling very sorry for myself in this pathetic state, I was offered something we hoped would turn out as hot chocolate – we didn’t know whether the dehydrated milk would work (and the chocolate did have little specks of white floating at the top). I guiltily accepted – guiltily because I still didn’t like hot drinks. But it gave me something warm and comforting to hold and to help encourage the blood back into my fingers. For further warmth and to mask my guilt, I forced myself to drink it, and by the end of the mug had decided that I no longer hated hot drinks. In Nicaragua I had my first ever cup of coffee, and then my second, third and countless more, all served hot, black and very sweet just as the locals enjoyed it. But I still didn’t tea for a few months more, until I had returned to the UK and was taken by my then-boyfriend to a new teashop that had opened in my absence. The menu at the teashop was dauntingly extensive for an inexperienced tea drinker such as myself, particularly when I was adamant that I didn’t like ‘normal’ (read: English Breakfast) tea. However, after some persuasion I agreed to try a first flush Darjeeling recommended by a lovely waiter we’d come to know through our frequent visits there. And I was hooked. Since then I have progressed from Darjeeling to become an avid drinker of the more readily available Earl Grey. The unfortunate consequences of this included my old roommate (she of the straw mattress) complaining that I made our flat smell like “the bottom of a tart’s handbag”, and at work being accused of drinking the ‘posh’ tea. Now, finally, I can enjoy an English Breakfast if not too strong, but would choose Darjeeling, Earl Grey or almost anything else, almost every time. I was lucky enough to find myself attending York University, York being the home of the infamous Betty’s (if anyone reading this works at Betty’s or knows someone who does, please please tell them to bring back the Engadine Torte, which was heaven on a plate and went so well with an Earl Grey tea). 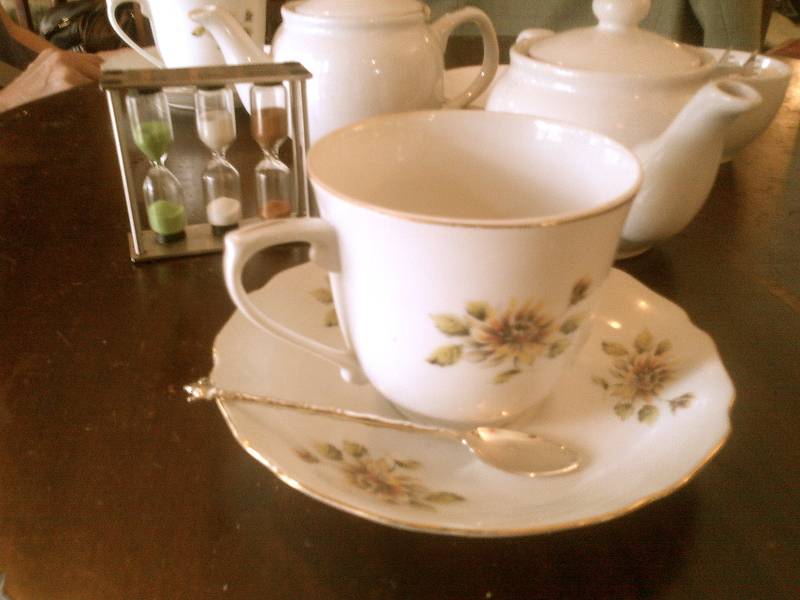 Needless to say I spent as much time as my student budget would allow in Betty’s (not enough) sipping tea. I was brought a packet of Moroccan Mint Tea from Fortnum and Mason as part of my birthday present, which was delicious and refreshing. University was a time of enlightenment as far as me and tea went, as well as the philosophy and politics I was there to learn. One of the lovely things about tea is the history that goes with it. Someone told me what they claimed was the story behind the origins of Earl Grey tea, though as I don’t know quite how true it is please don’t forward it on as fact or my old university lecturers will never forgive me. Apparently, an envoy of Earl Grey (a British prime minister in the 1800s) saved a boy’s life while travelling in China. The boy’s father was a mandarin and as a mark of his gratitude he presented the envoy with some tea to take home to his master. This blend of tea was given to the Earl back in the UK, who liked it so much he asked his local teashop (allegedly Twinings, but this could just be clever marketing on their part) to recreate the tea. When the details of the blend were recorded in their ledgers, they were recorded under his account and thus his name: Earl Grey. Regardless of the veridity of this tale I like the romance of it, the romance tea and its complex history. I like the delicacy of the flavours, and also of the teapots, strainers, cups and saucers that come with it. My favourite teaspoon was given to me by my ex-boyfriend, and is from the teashop where I first enjoyed a pot of tea. It has a slim, delicate stem carved almost like bamboo, with a tiny silver teapot adorning the end, and I adore it. I love carefully spooning tea leaves into the strainer in my little one-person tea pot, or scooping them into a strainer to put straight into a mug. I love pouring tea from a pot into a tea cup, and yet I get a whole different satisfaction from a steaming (Earl Grey) tea, made in the mug with a simple tea bag. If you have read my blog before, and if you intend to read it again (and I hope you will) you should remember that every time I sing the praises of cake, talk about new recipes I’ve tried or cakes I’ve sampled baked by others, I will always be enjoying said cake with a pot, mug or cup of tea, drunk black and sugarless, just as my darling-Darjeeling waiter first taught me.